If you are researching new windows and doors for your home, you will see a lot of information about U-Values and Window Energy Ratings. What are U-Values and what are Window Energy Ratings? The typical U-Values on windows is a measurement of heat loss and the rate at which it is lost. U-Values indicate the overall performance in retaining heat and preventing it from escaping to the outside. U-Values are measure in Watts per square metre Kelvin, or W/m2 K. In simple terms, the lower the U-Value number, the better the thermal performance of the window. Typical U-Values on windows and window energy ratings are similar to the familiar energy labels you see on home appliances, rated from A (the lowest), up to G, the highest or worst performing. Window Energy Ratings provide a simplified method of understanding the energy saving properties of a window. Some window performance figures are expressed with a U-Value and others with a Window Energy Rating, although the latter has been adopted as the more commonly used. How are U-Values and Window Energy Ratings Calculated? A mathematical formula is used to calculate the U-Value and Window Energy Rating (WER). In simple terms, the calculation uses a notional figure on the energy balance of a typical UK house in a year using a variety of window styles and configurations. It is important to understand these are calculations that, in a real-world situation, could be better or worse than the stated performance figures. 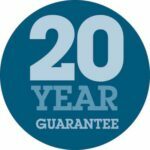 What is the minimum U-Value and Window Energy Rating for Windows? 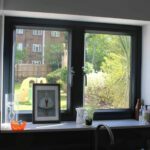 All new or replacement aluminium, PVCu or timber windows require a minimum C Window Energy Rating or a U-Value of 1.6Wm2K or less. Glass units today differ substantially from early generation double glazing. If you have old double glazed windows and doors before 2006 it is likely these have metal spacer bars around the sealed unit and just air space in between. Modern double or triple glazing uses a ‘Low-emissivity’ or ‘Low E’ glass coating, warm-edge (non-metal) spacer bars, Argon or even Krypton gas between the glass. All these coatings and materials enable a low U Value to a modern window. To give you an indication of U-Values in the home, we give some approximate figures compared to your property roof, walls and floors. As standard, our PVCu and aluminium windows come with Pilkington K™S glass, annealed (non-safety glass) where safety glazing such as toughened or laminated units are not legally required. 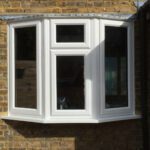 Our double glazed units include a soft-coat low-e coating, argon gas between the glass panes and a warm edge spacer bar. Textured and patterned glass located in bathrooms has the same glass specification with the internal pane having the obscure glass pattern. Typical U-Values on windows and Window Energy Ratings on PVCu and aluminium windows and doors. Our Liniar suite of PVCu casement windows feature multi-chamber profiles, specially extruded bubble gaskets, glazing flippers and other thermal enhancements. With a quality double glazed unit, approximate U-Values are 1.2Wm2K or alternatively a Window Energy Rating (WER) of A+. The Liniar EnergyPlus range contains 6 chambers and can achieve a U-value as low as 0.8 W/m2K with the correct glazing specification. Our Origin aluminium products provide the following typical U-Values on windows and approximate Window Energy Ratings (WER’s) with the following glass specifications. 28mm double glazed 4mm Diamant – 20mm 90% Argon – 4mm Total + . 20mm Swiss Ultimate spacer bars. Origin Window with Aerogel. 28mm double glazed 4mm Diamant – 20mm 90% Argon – 4mm Total + 20mm Swiss Ultimate spacer bars. 44mm triple glazed. 4mm Diamant – 2x16mm 90% Argon – 2x4mm Total +. 2 x 16mm Swiss Ultimate spacer bars. Origin Window with Aerogel. 44mm triple glazed 4mm Diamant – 2x16mm 90% Argon – 2x4mm Total +. 2 x 16mm Swiss Ultimate spacer bars. The above information is a guide and offers approximate U-Values and Window Energy Ratings, taking information from the system company websites and technical information. Window Ratings can vary depending upon the glass specification, window configuration and other factors. Contact us for more detailed information on window energy ratings.